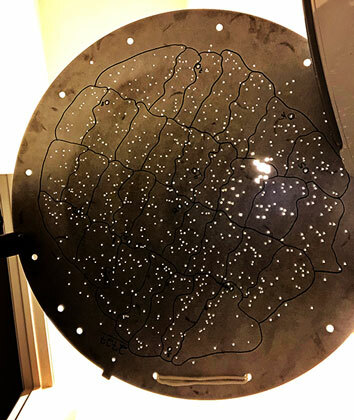 Well last week I did a show and tell of my very own SDSS Plate #2727 at the monthly OCA Astrophysics SIG and wanted to report back about some of the details of observations made using that plate. The history of my acquisition of this plate is covered in the January 16, 2019 blog post. 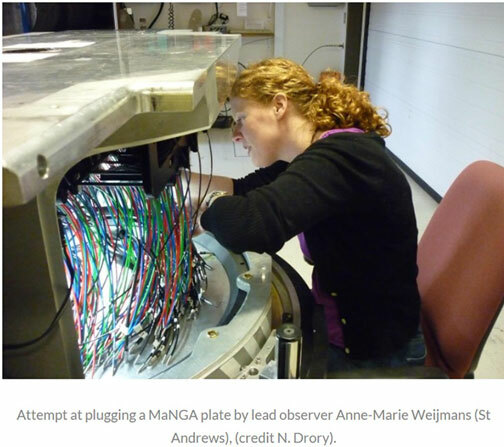 Fortunately there is a lot of information available on line from the Sloan Digital Sky Survey (SDSS) organization, who used over 4000 of these disk plates to map the structure of the universe using millions of spectra and redshifts from observed stars and galaxies. Nice! But for me one of the first tasks was to find a place to store the plate. 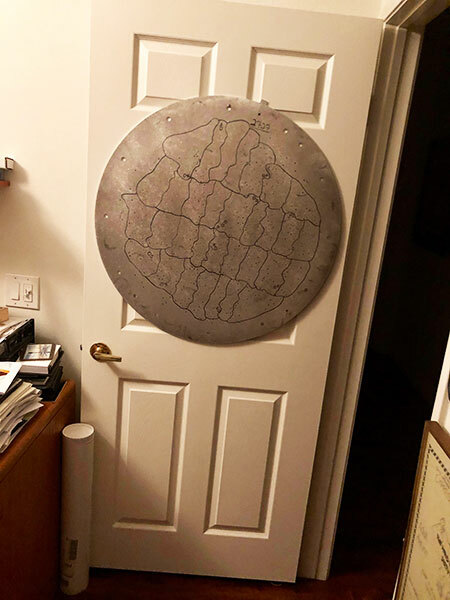 It turned out that just mounting it on my office door was a very convenient location. Other folks have used these old disks to make tables and art objects in entry ways to buildings and laboratories. I even saw one use where the disk was actually mounted in a door, not just hanging on the door, and the light could shine through the holes in the disk. Pretty neat! I tried shinning a light through the holes too and it seemed to work out ok. Check out the photo below where a ceiling light shines down on the disk. You can see that the illumination is not very uniform, but most of the holes are illuminated. 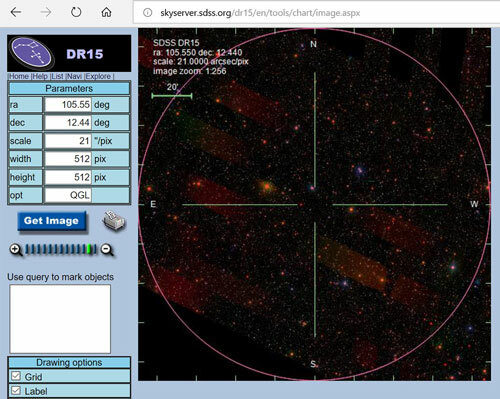 It turns out that the observations made with each numbered disk are available online as part of the SDSS SkyServer, which makes the observations available as public data. There was some question about whether disk #2727 was part of the 640 targets per disk study or of the 1000 targets per disk. Well, there was just 640 targets listed for disk #2727, so now we know. The disk was mounted on the Apache Point telescope and pointed at sky location, RA = 105.5583 degrees and Dec = 12.4431 degrees and covers approximately 3 degrees field of view. The Julian Date of the observation was MJD = 54414, which if my conversion calculation is correct, corresponds to November 9, 2007. On my first pass at converting the Julian date, I forgot that the reported date was Modified (MJD), which means the dates are reported as an increment to November 17, 1858, rather than January 1, 4713 BC. Whew, it is pretty simple to do the conversion, it is just that you have to remember the factors. 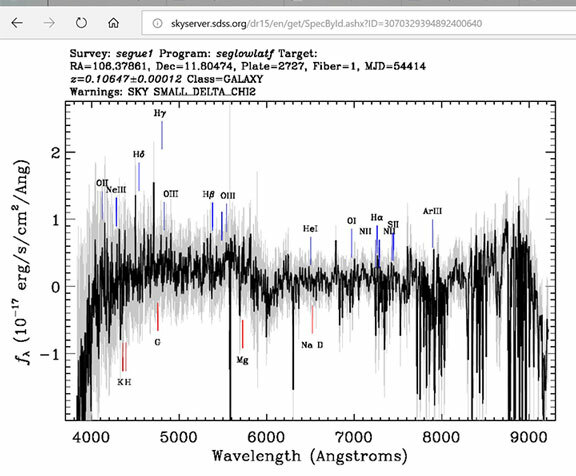 All of this setup information and measured spectra and redshifts for the first few of the 640 objects is shown in the screenshot below. 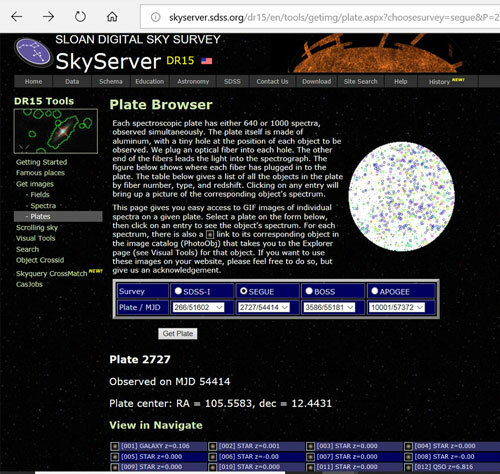 The SkyServer online database also includes sky views of where the disk is pointed. The field of view is about 3 degrees. So, as an example, as I try my hand at recovering some of the spectra from the 640 targets. The first one is for a galaxy found at fiber #1, which was identified as having redshift z = 0.106. Target #1 has sky coordinates of RA = 106.37861 degrees and Dec = 11.80472 degrees. You can see this target galaxy has many emission and absorption lines associated with hydrogen and oxygen and other heavier metals like magnesium and sodium. I don't know what to make of all of this but it is a pretty good example of the type of data that was obtained with disk #2727. In the future, now that we can sort of see how to get into the SDSS data base, we maybe can start doing some citizen scientist project. One of the questions that came up in the show and tell at the OCA Astrophysics SIG was how all of the fibers are installed in the disk plate. As far as I could find out, all of the 640 fiber optic cables for targets, plus a few more for calibration and guiding, were installed by hand. Check out the image below. Ok, enough about plates and plugging. 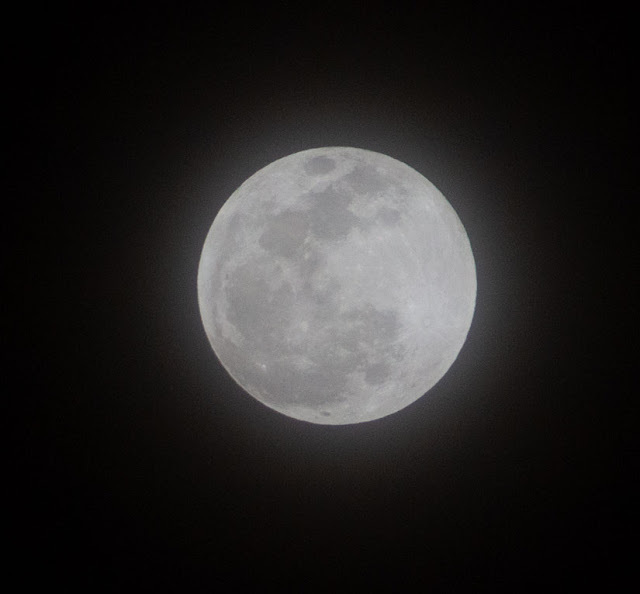 It is time to hopefully get at least one photo of the lunar eclipse of January 20. 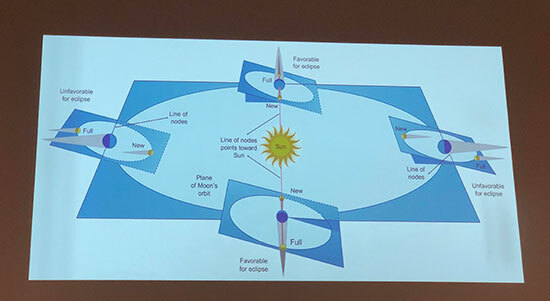 But first let's review some basic astrophysics of eclipses with the help of this diagram that Chris Butler displayed at the recent January 11 monthly meeting of the OCA. This diagram shows the path of the Earth's orbit around the sun, called the ecliptic. The Moon's orbital plane around the Earth is tilted with respect to the ecliptic and there are just two times each month when the sun, the Earth and the Moon, all three line up in a straight line. These are the times that eclipses, either solar or lunar, can occur. A solar eclipse occurs when the moon, always a new moon, is between the sun and the Earth. A lunar eclipse occurs when the Moon, always as full moon, is on the opposite side and the Earth is between the Moon and the Sun. Luckily, the apparent size of the sun and the moon is approximately the same and total eclipses can occur. In the astronomical era future, as the moon drifts further and further away from the Earth, total eclipses will not be possible. Oh well, that is a long , long way off. Thanks for that diagram, Chris! A first look at the two orbital planes, for the earth and the moon, can indicate when it is possible to have a lunar eclipse or a solar eclipse. So each month, the moon trajectory is such that it crosses the ecliptic twice. Once when it goes below the ecliptic and once when it rises above the ecliptic. Hmm, so the occurrence of an eclipse could be calculated and predicted if these orbital planes were well known. So, yes, the occurrence of eclipses can now, and apparently even in ancient times, be predicted. 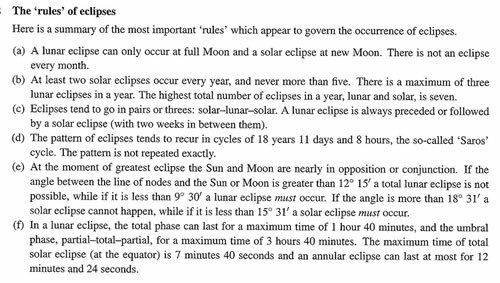 I found the interesting collection of "rules of eclipses" shown below. I will need to do more studying to see why the rules say that at least two eclipses must occur each year, but no more than five, for example. Ok, so now that we know a little bit more about the astrophysics of eclipses should we go outside and take a look? 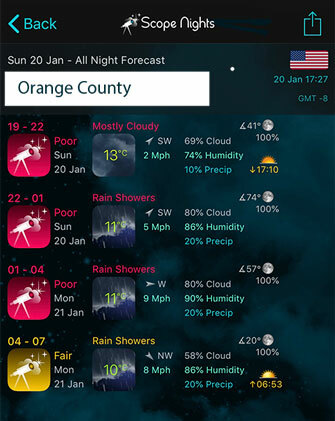 Hmm, the weather forecast is not looking very good for eclipse viewing tonight. Yep, that is the luck of the astronomer. We should have been meteorologists; at least we could be busy every day and night! 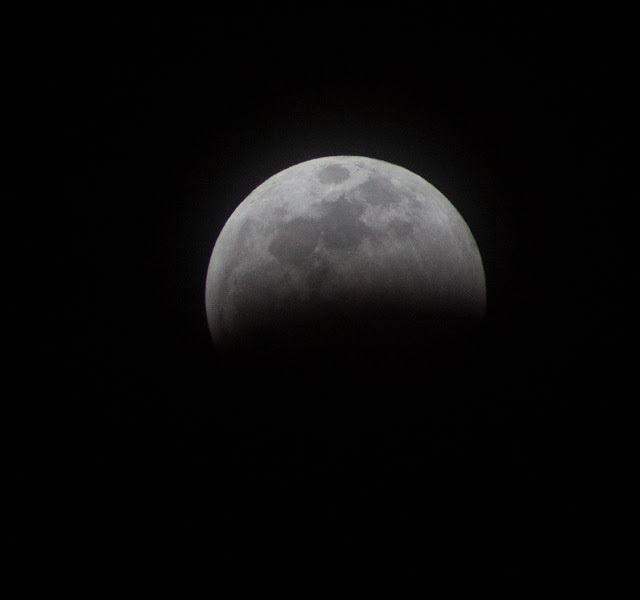 Well, as it turned out, the clouds were pretty thin early in the evening and I managed to get this pre-eclipse shot at 6:32PM. At 7:33PM the eclipse began to take shape. Now the eclipse has started and the clouds are starting to close in. But you can see that by 8:01PM when this photo was obtained, the Earth has taken a bit out of the moon! 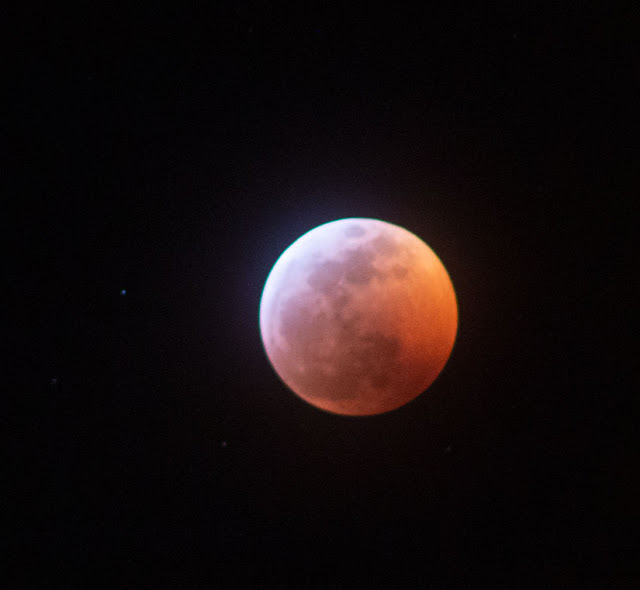 Finally, and luckily, just as the clouds really start to move in, I got this blood moon. 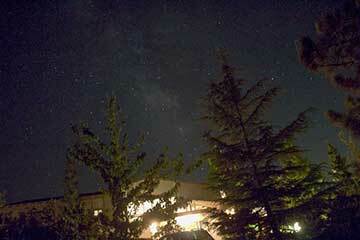 The total exposure time for this shot is now something like 4000 times longer than the partial eclipse image. The blood moon is getting very dim. Hmm, there also seems to be some sort of focal length error between these three images because the moon apparent size in the last image is smaller than in the first two images. Hmm, somewhere along the way, it seems that maybe the lens focal length got jiggled and changed. Anyway, no repeating this series of photographs because within just 5-10 minutes, the clouds came back to completely block out the dim moon. At least, we were lucky enough to get the start of the eclipse and even a little bit of the total eclipse.